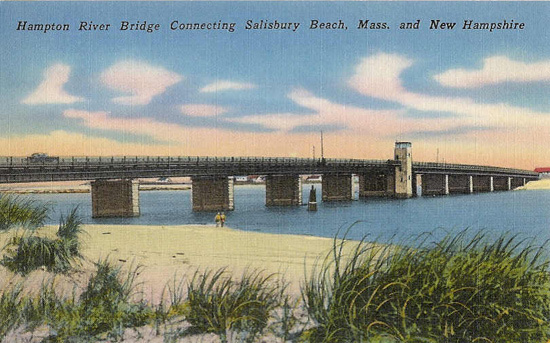 The best resources for information about the history of Salisbury and Salisbury Beach are two out of print books. If you live in New England you should check to see if your local library can find you a copy of either of these books. 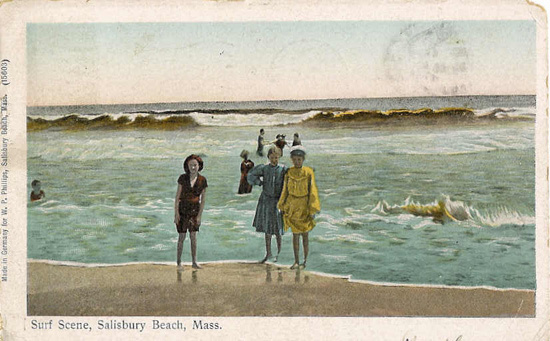 Images of America: Salisbury Beach by Pamela Mutch Stevens discusses the history of the area and has a lot of great photographs. The other book is "Salisbury Beach, 1638-1913 : a place to gather" by Betsy H. Woodman. It covers the history of what was called the "Great Gathering." This Salisbury celebration was held annually, in September, for well over a hundred years. It attracted thousands of people and over the years featured performances and speeches by many famous people. When you visit Salisbury today there is little indication that it has such a rich and vibrant history. It once was a well known resort destination that many people wanted too and did visit. A variety of circumstances led to the local area historically being a place where people found themselves going to, even prior to the Great Gatherings. This means there are numerous accounts, records, and odd things you can dig up about Salisbury Beach if you begin to poke into its history. The following are but a few examples. One of the famous amusement rides on Salisbury Beach was the Dodgem. 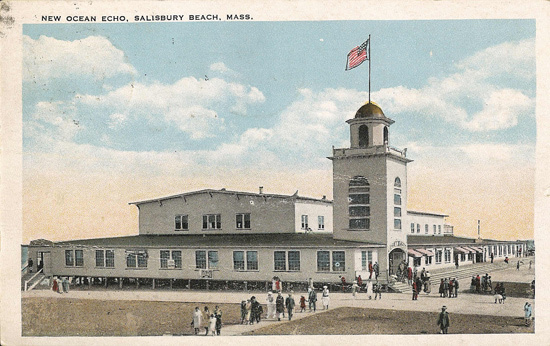 Similar rides were and still are found in other amusement parks but the first prototype was built and operated in Salisbury Beach. Most people that have ever been on a Dodgem ride know them by another name - bumper cars. The original bumper cars were built at a time when cars, and even more so an electric car, was a real novelty. The Dodgem name was first used because the cars were hard to steer. It was thought the greater challenge was to avoid other cars in the Dodgem arena, since it was assumed most people would pay to enjoy the novelty of being able to drive an electric car. There was a Dodgem ride in one form or another operating at Salisbury Beach from 1920 to 1980 (the picture at the right is a modern day version at the Amusement Pier at Seaside Heights, New Jersey). Here is an excerpt that describes how the first prototype ride was built. That first car was built by Stoehrer in a bungalow located on Combination Street in Methuen. Stoehrer's son and I built the rest. The [Salisbury Beach] installation was at Driftway and Ocean Front North. Before we could build the cars we had to build a wooden platform for the floor, which we covered with tin and the ceiling was made out of chicken wire. Then we built the other nine cars right on the platform. The cars were round in design and were constructed with wood and covered with sheets of tin. There was a balance problem, and to keep the cars from tipping, the weight had to be centered in the main castor located on the bottom. Three smaller castor wheels were placed around the diameter of the base and these allowed the cars to move and they also acted as balance wheels. We painted all of the cars red, gave them a little fancy trim, and we were ready to open in the summer of 1920. This ride operated for a year and was replaced the following year by a much improved version. You can read more about the history of bumper cars at Salisbury Beach at the Lusse Autoscooters website. 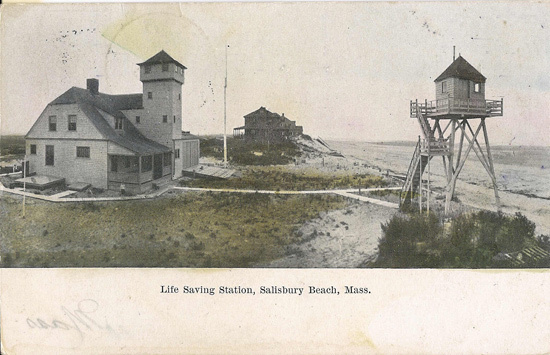 In a course nearly North from the lighthouses on Plum Island, and about half a mile distant, across the mouth of Merrimack River, is the southern extremity of Salisbury Beach, called Salisbury Point. From this point a sand-beach extends on the verge of the ocean, without an inlet or interruption of any consequence, until it reaches Hampton River. This beach is connected with the main land by a salt-marsh, of considerable extent, intersected by a variety of small rivulets and creeks, which render it impossible for a shipwrecked mariner to reach the inhabited parts of Salisbury. Here, too, the hapless seaman is sometimes destined to suffer the' misfortunes of shipwreck, and to reach a desolate and inhospitable shore, only to aggravate the horrors of his death. If he can attain the first and wished-for object, in evading the jaws of the angry ocean, he yet finds himself a solitary wanderer on the coast, without shelter, and without sustenance ; and, in his fruitless search for them, must inevitably perish. As the N.E. storms are generally most fatal to vessels on this part of the coast, Salisbury Beach is not so often a place of shipwreck as Plum Island. But, to guard against a possibility of accident, which must sometimes happen to the unskilful or inexperienced navigator, the Marine Society erected a hut, similar to those on Plum Island. Here they deposited every thing necessary for the relief of such as might need it, and were at the pains and expense frequently to inspect it, and renew their generosity by replenishing it : but this has shared the same fate with those on Plum Island ; not so much, however, from the insufficiency of its foundation, or the violence of the winds, as from the wantonness of individuals and companies, who frequent this spot, in the warm season, on parties of pleasure. The Merrimack Humane Society have extended their benevolent views to this part of the coast, and have erected a hut about three-quarters of a mile north from Black Rocks, so called, and about 150 paces from the sea-shore. This hut will be maintained in commodious repair, and provided with every thing suitable for those who may be so unfortunate as to need its shelter. Others, on the same coast, will be erected as speedily as the funds of the society, and the charity of individuals, will render it possible, and will be conveniently furnished and provided for the same laudable purpose. From: The Colombian Navigator; Or, Sailing Directory for the American Coasts and The West Indies. By John Purdy. Published for R.H. Laurie. 1839. You can look at a digitized version of an 1819 map of the northeastern seaboard that John Purdy helped produced. Prior to settlement by the English colonists, members of the Pawtucket Indian group inhabited coastal areas of Massachusetts Bay from the Saugus /Salem, Massachusetts area to York Village, Maine. This group is locally referred to as the Pentuckets. These Native Americans subsisted primarily on shellfish, and supplemented their diet with wild game and a variety of both wild and domesticated plants. They hunted both wetland and upland game birds and fished shad, salmon and trout along the Merrimack River, which was their summer fishing ground. Signs of the early inhabitants have been found mostly along the Merrimack River. Thirteen shell mounds have been discovered along the bank of the river. In addition, in 1868, Jeffries Wyman reported discovering large collections of Indian arrowheads and implements on the beach, approximately one mile from the left bank of the Merrimack. In addition to these artifacts, local historians have re-traced a number of Indian trails along and in close proximity to Salisbury Beach, as well as inland. These trails include what are now Ferry Road and Seabrook Road. This trail later developed into a Colonial route that linked coastal areas to the north (New Hampshire) with the Merrimack River. Elm Street was likely as western-running trail. Water travel was also extremely important throughout the coastal area. Numerous creeks and coastal rivers such as the Merrimack River provided transportation routes to the coast. European colonists first settled in Salisbury in 1638. Permission was given to 12 petitioners by the English government to begin a plantation called Merrimack Plantation. This plantation included New Hampshire’s plantation of Exeter, Hampton, Portsmouth, and Dover and Massachusetts’ plantations of Salisbury and Haverhill. Only five individuals and their families actually settled in what is now the town of Salisbury. The initial settlement was made near the ocean in the vicinity of Beach and Ferry Roads. In 1645, a highway to the Beach, which is now called Beach Road (Route 1A), was laid out. from the "Salisbury Beach State Reservation Barrier Beach Management Plan 2008" Masschusetts DCR.